Health & Safety (H&S) should always be considered as a priority! It is a basic requirement that has to be ensured around the campus without fail. The goal of health and safety programs is to foster a safe environment for students and staff. 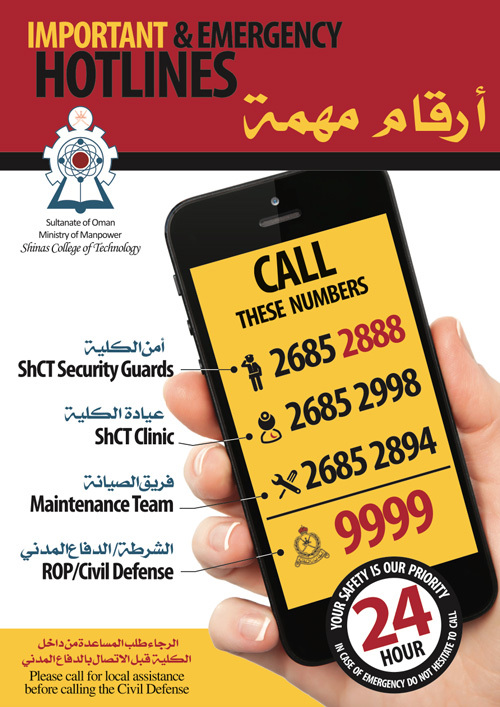 Shinas College of Technology (ShCT) ensures that its facilities comply with the H&S standards of Oman. Quality Sub-Manuals (QSM) are used in all laboratories and workshops to guide the students and staff in H&S issues. ShCT has constituted an H&S committee which is responsible for ensuring H&S for the college community and reports to the Dean. College has safety provisions like fire alarm, fire extinguishers in all the labs and workshops and marked assembly points and a clinic to take care of any health-related emergency. Emergency exits and other H&S signs are clearly displayed to ensure the safety of visitors. All College staff and technicians are responsible for ensuring the H&S policies are conformed to, within the campus and during field trips.